Altus Press is expanding its Wild Adventures line of classic pulp fiction characters starring in new exploits, which last year added the Wild Adventures of Tarzan to the ongoing Wild Adventures of Doc Savage licensed series. Our September release is the first volume in the Wild Adventures of Pat Savage. 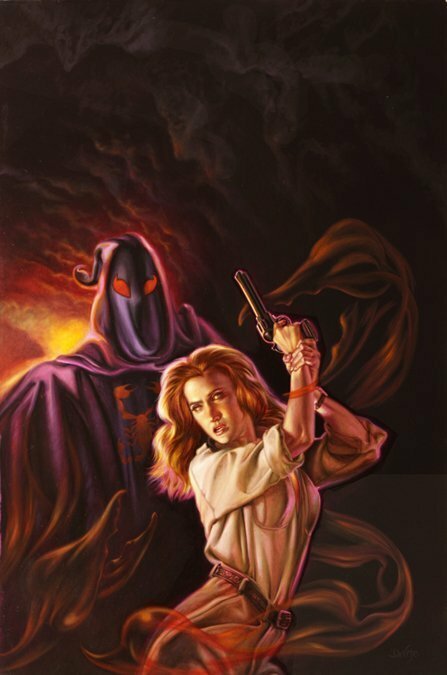 Move over, Nancy Drew and Annie Oakley, Doc Savage’s feisty cousin Patricia is getting her own series! Written by Will Murray, the creator of Marvel Comics’ Squirrel Girl, and based on a outline by Doc Savage originator Lester Dent, Six Scarlet Scorpions teams the bronze-skinned golden girl with Doc Savage associate Monk Mayfair in her first solo adventure. Patricia Savage had come to Tulsa to speculate in oil. That was all. To make a quick killing and go home richer than before. But when a man claiming that his blood had been drained to feed an unknown creature begs Pat for help, she drops everything and goes on the warpath. Soon Pat and her business partner, Monk Mayfair, are on the run from the Oklahoma law. The proof of their guilt? Indelible scorpions tattooed to their faces! For October, there is the long-awaited King Kong vs. Tarzan. Fans of both iconic characters have long dreamed of a face-off between these jungle giants ever since Kong creator Merian C. Cooper attempted to film one back in 1935. Fully licensed by Edgar Rice Burroughs Inc. and the Cooper estate, King Kong vs. Tarzan recounts the previously untold story of the sea voyage from Skull Island to New York City in which the mighty Kong was transported to his doom back in 1933. When Kong nearly breaks his chains, the crew of the tramp freighter Wanderer are forced to release him into the african jungle, where, lost and hungry, the former monarch of Skull Island blunders into the domain of another jungle ruler—Tarzan of the Apes! The stage is set for the ultimate rumble in the jungle. But will the beast-god and the ape-man become foes—or friends? 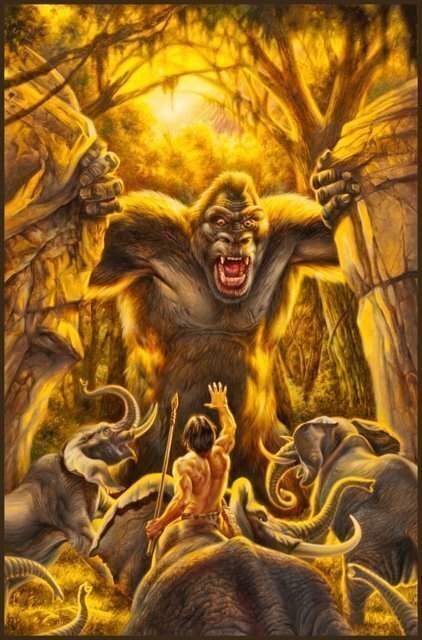 Written by prolific pulp novelist Will Murray, King Kong vs. Tarzan is a follow-up to last year’s Tarzan: Return to Pal-ul-don and marks the start of the Wild Adventures of Kong Kong. Finally, the 13th installment of the Wild Adventures of Doc Savage brings the Man of Bronze to 1930s Wyoming to investigate a seemingly supernatural mystery that begins when a naked man is sighted swimming in circles high over the Big Horn Mountains. When he falls to his death and is discovered soaked to the skin in spite of a long summer drought, Doc Savage realizes that something sinister is afoot. Extortion notes prove that a human agency lies behind a growing outbreak of levitation murders. After a passenger airliner slams into a mysterious floating body of water, the crisis escalates. From the Big Horn Mountains to Devil’s Tower, Doc Savage and his mighty crew race against time to avert an impending tragedy created by the unknown devil in human form who calls himself Mr. Calamity. Bylined Kenneth Robeson, Mr. Calamity is a December release. All three titles will be release d in hardcover, trade paperback and ebook formats with cover art by acclaimed illustrator, Joe DeVito.